There are about 35 species of pine tree found throughout North America, particularly in the northern areas. In addition, a number of foreign trees, such as Scots pine and Austrian pine, have been introduced for commercial and ornamental purposes. Pines are evergreens with long, needle-shaped leaves. The female flowers of the tree are called cones. Depending on the type, pines have a variety of commercial uses including furniture. The varieties of shapes and the durability of pines make them attractive choices for the home landscaper. Learn more about the different types of pine trees and the insects and diseases that affect them. 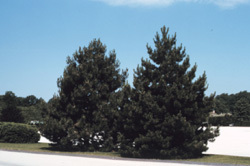 Find products to help you care for your pine tree.